John, a U.S. Air Force veteran who served for four years, dreamed of visiting the war memorials in Washington, D.C. with his friend, caretaker, and fellow Vietnam veteran, Ed. 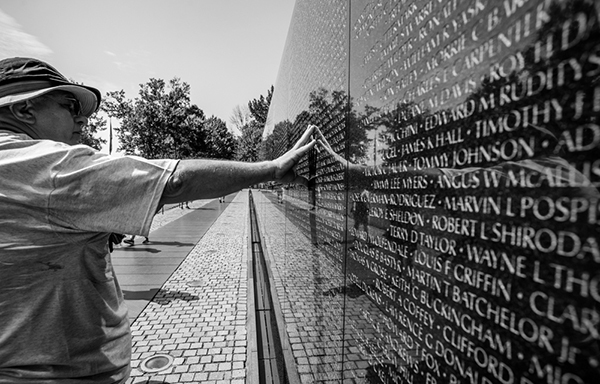 John remembers seeing fallen veterans during his time in Vietnam and says that even though he will never know their names, he would like to connect with them by touching the Vietnam Veterans Memorial Wall. With assistance from Honor Flight’s Their Last Chance program, which transports America’s veterans via Southwest Airlines to Washington to visit the memorials dedicated to honoring veterans’ service and sacrifices, John and Ed visited the National World War II Memorial, Lincoln Memorial, Korean War Veterans Memorial, the U.S. Capitol, the U.S. Navy Memorial, the Naval Museum, Arlington National Cemetery, the Marine Corps War Memorial (Iwo Jima Memorial), and the U.S Air Force Memorial. John and Ed were also honored for their service and presented with Vietnam War Commemoration Pins* at the Vietnam Veterans Memorial Wall by James McLaughlin, Honor Flight chairman of the board.